For a village of roughly 4,000 residents, Rosemont is rife with hotels. Nearly 20 of them populate this northwest suburb, in the shadow of O’Hare International Airport. 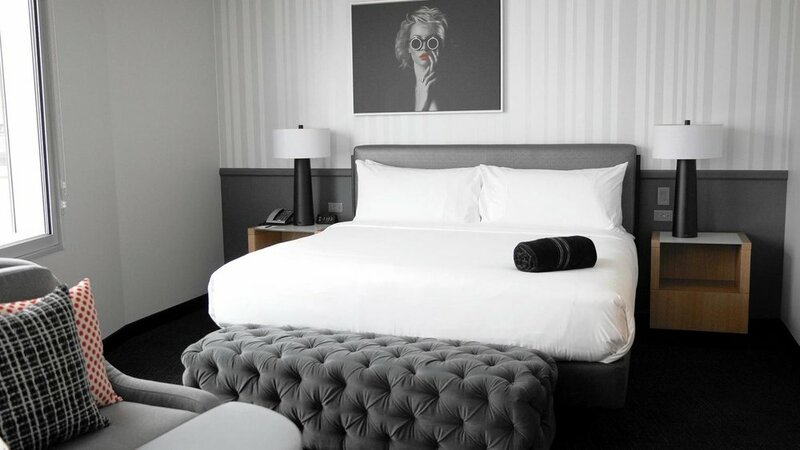 Yet another hotel is about to join Rosemont’s ranks, but this one is billed as the town’s first boutique offering: The Rose, a 165-room property “where classy meets edgy.” It opens Thursday. Owned by Riverwoods-based Janko Group, the artsy, modern hotel is part of Hilton’s Tapestry Collection. The brand, launched in early 2017, is aimed at relatively upscale travelers who crave the unique, non-cookie-cutter feel of an independent hotel — no two Tapestry properties are the same in name or style — without sacrificing the reliability and loyalty points that come with an established name like Hilton, Hyatt or Marriott. The Rose marks the 14th hotel in the Tapestry Collection and its first in Illinois. It’s also the first property in the portfolio built from scratch. Construction crews broke ground in September of last year. Measuring five stories high, the low-slung, two-toned gray building at 5200 Pearl St. is the latest addition to Rosemont’s new Pearl District. This 16-acre mixed-use development includes an outpost of the arcade-sports-bar-restaurant Dave & Buster’s, the Italian eatery Carmine’s(part of Chicago’s Rosebud family) and Truluck’s Seafood, Steak and Crab House, a Texas import. The Rose is close — really close — to O’Hare. That proximity influenced its amenities and design. Triple-pane windows let you to see, not hear, the endless parade of planes coming and going at one of the world’s busiest airports. Flight schedules are displayed on a large monitor by the hotel’s front door, and a complimentary 24-hour shuttle takes guests to and from O’Hare. The hotel has three meeting spaces that can double as temporary boardrooms for travelers needing to do business close to the airport. Two small ballrooms can accommodate between 100 and 150 people for midsize functions. In the public space between those two ballrooms, lighting is in the form of a dozen open umbrellas hanging from the ceiling, bathing the room in soft pink — an accent color that pops up throughout the hotel. The umbrella installation is one of several whimsical design touches, the most notable being the zebralike black-and-white stripes plastered across a 44-foot feature wall in the lobby. Several 8-foot-tall mannequins also got the so-called dazzle camouflage treatment, creating an optical illusion of sorts — and, not by accident, a made-for-Instagram moment. The long, ground-floor lobby/lounge features a funky, round fireplace and numerous places to kick back and congregate, like the sleek, white bar and clusters of gray sofas near big-screen TVs. The open concept extends into the 65-seat restaurant, serving breakfast, lunch and dinner, where foie gras popcorn ($15), chicken and waffles ($16) and duck confit with shrimp and grits ($23) are on the menu. Executive chef Nicholas Malloy, whose previous gigs include the JW Marriott downtown, oversees the restaurant and the adjoining 16-seat, glass-walled private dining room. The Rose doesn’t offer traditional room service. Instead, guests can order by phone off the dinner menu and come down to the bar to pick it up. A small “market” near the front desk sells a selection of grab-and-go items, as well as booze and other beverages. Standard guestrooms with a king or two queen beds will likely average $259, Solomon said, with rates skewing higher in the summer, lower in the winter. At 388 square feet, deluxe rooms are about a third bigger than standards and cost $25 to $50 more, depending on the season. 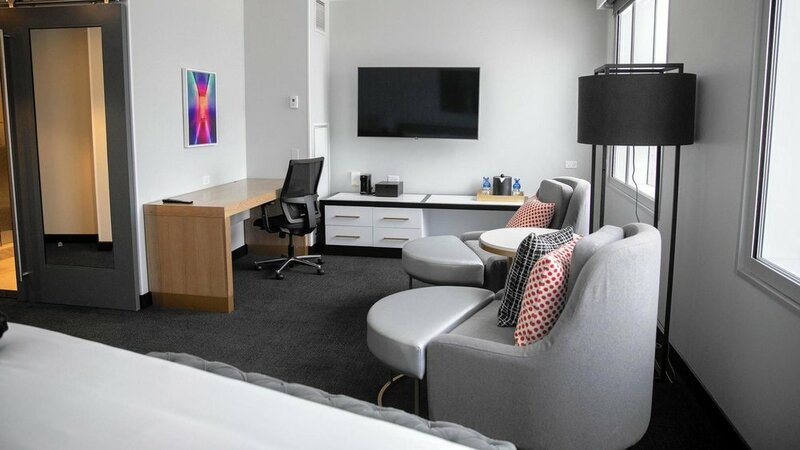 The Rose has only two suites, which can be configured into a studio or a two-bedroom option. Overnight parking is $25, and Wi-Fi is free. 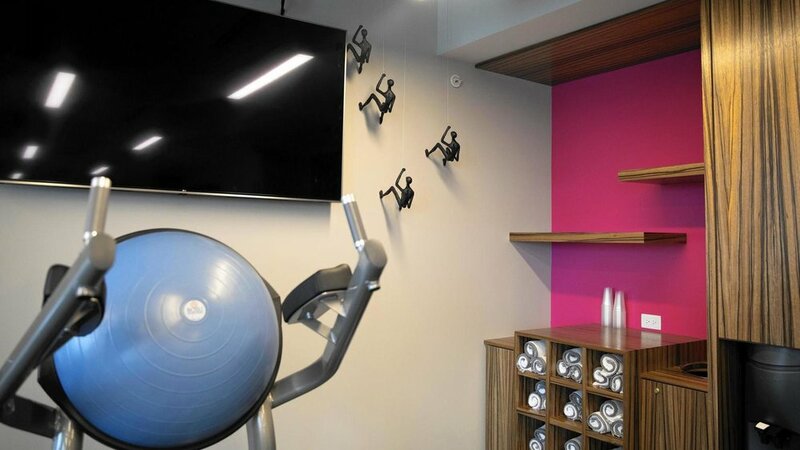 Fitness center? Check. Pool? Nope. Most of the contemporary rooms have glass walk-in showers, not tubs. All have work stations, no minibars. In addition to the airport shuttle, The Rose has another shuttle designated for guests wanting a lift to and from the nearby Rosemont Theatre, Fashion Outlets of Chicago mall, Rivers Casino in Des Plaines or anywhere else within a 3-mile radius of the hotel.